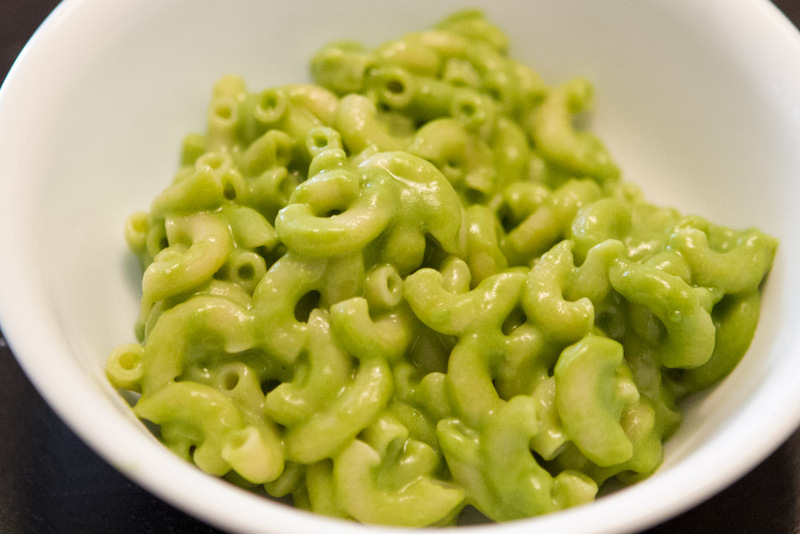 My friend told me about a green mac and cheese recipe, but for the life of me I couldn’t find it when I needed it. So I called up my buddy, Google, and he gave me a Weelicious recipe that looked good. The problem is, if Joshua can see vegetables, he’ll reject it before even trying it. So I made the “base” green mac and cheese based on the Weelicious recipe with a spinach cheese sauce, and skipped adding the broccoli and peas for Joshua. I figured if there’s *some* spinach in the sauce, that’s better than no vegetables at all. First of all, let me just say that Joshua’s pickiness is 99% my fault. He used to eat fruits and vegetables. But when he started to become picky, I just let it happen. I made separate meals for him (a big no-no) because he won’t eat what I eat and I didn’t feel like fighting him. I have no one else to blame but me. For the most part, I try not to worry about his lack of fruits and veggie intake. But I am trying to convince him that fruits and vegetables CAN taste good without forcing him to eat it. Joshua saw the mac and cheese and asked me what it is. I said it’s green mac and cheese. He asked again what it is. Damn it, he knew I was trying to avoid his question. I said it’s a spinach mac and cheese. “Spinach?” he said. He shook his head. I scooped up a few pieces of the macaroni, and said, “try just one bite.” He slowly took the bite. 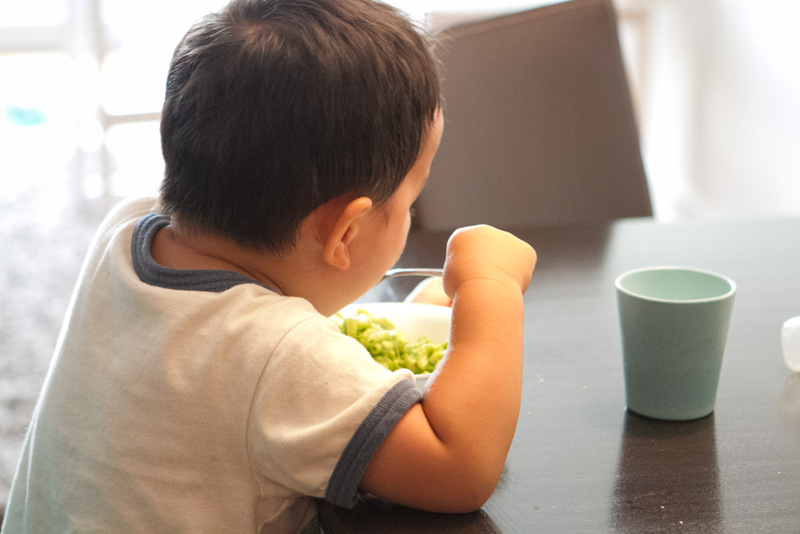 Then he pulled his chair out, climbed onto his seat, ate the entire bowl, and asked for seconds. Here’s the recipe I modified, based on the Weelicious one. All measurements approximate. While the pasta is cooking. Place the milk and spinach in a blender and blend on high speed until smooth. This is key for us, to blend until no visible spinach pieces is left. In a large pot melt the butter and then add the flour, whisking continuously over low-medium heat for 2-3 minutes to make a roux. Slowly whisk in the spinach milk mixture and bring to a boil. Add cheese and whisk until melted. Stir in the pasta. Serve with freshly grated cheese. For my own portion, I added cooked broccoli florets and green peas. Yummy! My picky eater chowing down the green mac and cheese! This entry was posted in Cooking and tagged cooking, green, kid friendly, mac and cheese, recipe, spinach by angelasaito. Bookmark the permalink.